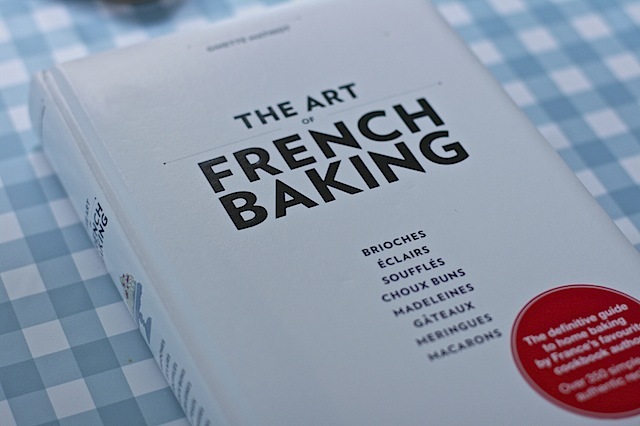 Meet The Art of French Baking by Ginette Mathiot published by Phaidon. You know Phaidon books, they’re those big tomes in the manner of Silver Spoon that cover various cuisine comprehensively. Now I’m not knocking this book as a whole yet, because that would be unfair after attempting one single recipe. But I’m not impressed by what I’ve experienced so far. And I write this as an open question, just how does stuff end up in books that’s plain darn WRONG? I was on a mission to make cigarettes. No, not those sort of cigarettes, the tubey biscuits that you see served alongside ice cream. The irony of this is that I can’t stand wafery biscuits stabbed in my ice cream and always hand them to my husband to eat. But in the interests of extending my baking expertise, I decided to attempt les cigarettes and picked an authoritative book on French baking to guide me. One should end up with a wafer thin biscuit that gets rolled up whilst still warm in the manner of a brandy snap. 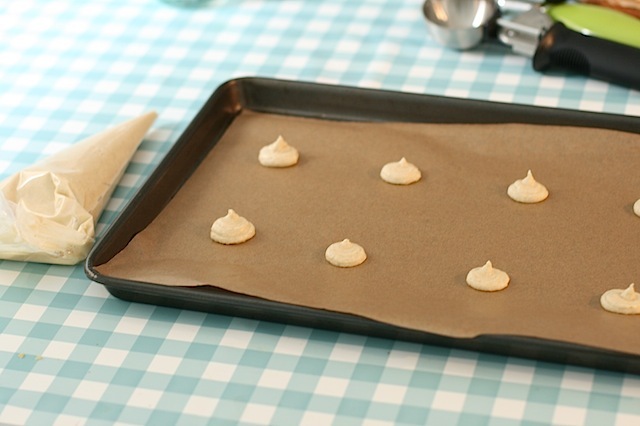 Knowing how brandy snap batter spreads to a lace like consistency in the oven, I was not put off by instructions to pipe discs of batter 2cm in diameter onto a tray leaving “space” between them. The recipe didn’t instruct how much space exactly so I conservatively piped 8 discs on one tray. 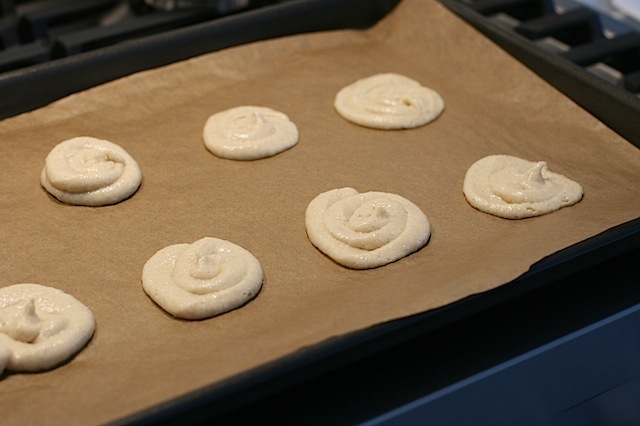 I only baked one tray at a time as I foresaw that rolling them fast enough whilst warm would be tricky enough with 8, never mind more. But alarm bells did ring when the recipe said to preheat the oven at 200c / Gas Mark 6. Most biscuits bake at around 180c / Gas Mark 4. Bearing in mind these guys were tiny, I had concerns this wouldn’t work. Sure enough, I had black little bullets rather than thin cream circles to roll up into golden cigarette biscuits. So I tried again. This time with the oven down to 170c / Gas Mark 3. And I piped larger flat circles. There’s been some thorough deviation from the published recipe by now. I’m really winging it on my own initiative, but surely these will work? Bearing in mind macarons still spread a bit at this temperature. Nope they’re still not spreading thin enough to roll up. Note to self. 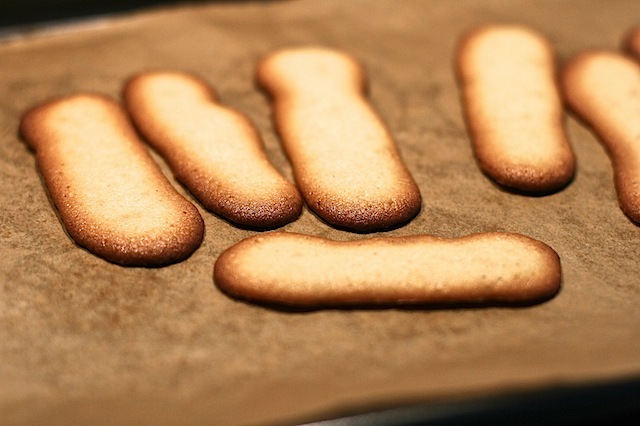 Check internet for alternative cigarette biscuit recipes to compare with Ginette’s version. Something has gone badly wrong here. To salvage something out of the ingredients used, I piped long sausages of batter and ended up with a few fingers just about suitable for serving with ice cream. I will blog those separately shortly. So I have my home made ice cream biscuits, but I’m still craving cigarettes. With thanks to Kerrygold block for product sample. Not exactly the best illustration of it but I can vouch that it is softer than usual butter and it does indeed mix beautifully into cake/biscuit batters without needing to be left out of the fridge for ages. The Art of French Baking was a personal purchase. Deb Perelman’s new book ‘Smitten Kitchen’ has recipes in it with stray ingredients and instructions. I know what to do with saved fruit juices but less knowledgeable cooks might puzzle over their inclusion in one part of the recipe with no instructions given as to what to do with them once prepped! That’s so frustrating. 200o/c seems too ridiculously hot for something as delicate. I hope your quest for a better recipe goes well! It’s because of lack of money. Publishers commission books and don’t give the budget to test. I should know, I’m writing one. I hope there will be no mistakes because I’m testing every single thing myself or asking someone else to do that. In my last book, there was a massive mistake. Not in my manuscript, but by the time it got to the printers. I must say, it being my first book, I didn’t realise that actually it was down to me to check every recipe, to copy check at the end. I assumed the editors would do that. But they don’t, because they have too much work, too many other books to work on. All the money is thrown at certain big projects, big names or names they deem to be big (Pippa Middleton, Tim Hayward). You’d think with the above book, it’d be big enough and authorative enough to get it right. There is also the issue (this was the problem with Hummingbird) that professional bakers have different ovens and also sometimes are just scaling down a professional mass recipe to one for 4 to 6 people. This doesn’t work either. I suppose if a book is published with an error, it’s the writer who gets the bad press rather than the publisher – many of us have heard about the Hummingbird errors but few would be able to name Hummingbirds’ publisher if asked. Publishers have no interest in funding recipe testing because they know their name isn’t the one that will suffer if there’s a clanger. I was fortunate enough to have an excellent desk editor proofing my own book as well as myself but the reliability of the content was entirely down to me. BTW I have it on good authority that Nigella had a stylist flown in from New York especially to work on her photoshoots for Nigellissima. Which puts publishers’ reluctance to even fund ingredients on smaller projects into perspective. I can concede that someone like Nigella merits a bigger spend but seriously, do we not have food stylists in the UK they could use? It’s understandable a dead cert huge best seller can justify a publisher doing this but where I take issue is that smaller writers are – as you say – barely paid minimum wage to produce the content whilst everyone working for the publisher gets a salary ostensibly for far less work. On the basis that everyone administering the non-creative side to production of the book gets paid a respectable rate for their input to the project, it’s (to re-use my own phrase) plain darn wrong if the person creating the thing in the first place doesn’t. Mentionining no names, there are various best selling cookery book “authors” whom I believe have little deeper input than brainstorming ideas at a meeting then showing up to pose for photoshoots of the dishes after a team of maybe 12 other people have produced it (and indeed cooked it) for them. I have to say every recipe I’ve done from the Smitten Kitchen book has worked perfectly for me. Not seen any mistakes yet…. Do you remember when I was cooking my way through the first GBBO book and give up in disgust after 6 recipes as it was so bad. The worse was a pie recipe that used shortcrust pastry and had a photo using puff. It is not surprising that so many people claim that they cannot cook, when it is the recipe not them that is wrong. If you know about cooking you can claim the book, but if not you are not to know that you are not at fault. It’s seriously annoying when it doesn’t work out the way you want it too. I mean your wrong if you follow a wonky recipe and your wrong if you wing it because you didnt follow instructions! Its a catch 22. 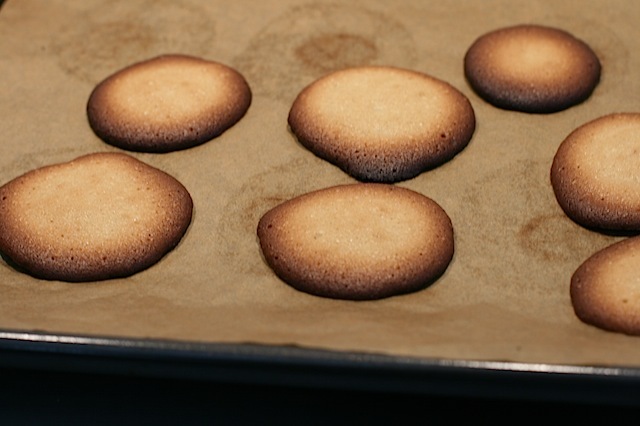 You know the worst thing is, I looked in same chapter at the tuiles recipe and it still says 200c. Starting to wonder if my new oven is dodgy?! Thank you for giving me another reason not to bake! 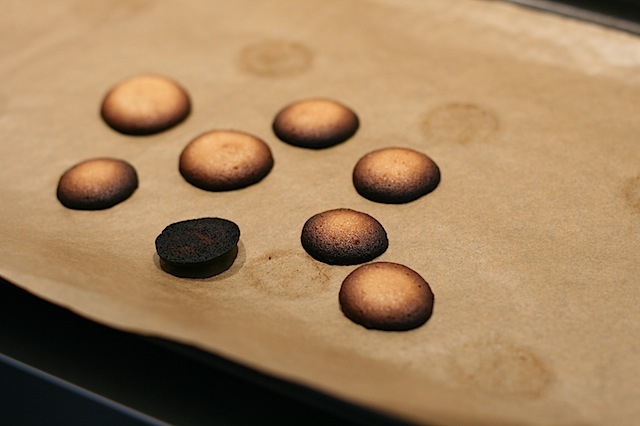 Your blog looks beautiful – even the burnt biscuits. Am enjoying a nosy around as i drink tea and eat Tunnocks teacakes (another good reason not to bake).